My research focuses on a group of tropical plants in the legume family (think beans, peas, clover). Unlike most of the legumes in the temperate regions of the world, which tend to be small annuals, many tropical legumes are large rainforest and savanna trees, as well as smaller shrubs. My group, known as the Dialiinae clade, consists of around one hundred species of trees, as well as a few shrubs. The flowers of the Dialiinae display much more variation in form than we normally see in this family, making the study of their evolution of interest to botanists like myself. For example, legume flowers typically have five petals and ten stamens, but many flowers of the Dialiinae have lost (over the course of their evolution) all of their petals and all but two or three of their stamens. What’s more, the evolutionary relationships within the group (its ‘phylogeny‘) aren’t well understood. That is, we often don’t know the closest relatives of a given species. My research aims to address these subjects in three different ways. Morphology is the study of the actual physical form of a plant. Generally speaking, physical form changes slowly over evolutionary time, such that plants which look more similar are more closely related. Because there are exceptions to this rule which aren’t always apparent, we look at a large number of different physical characteristics and group the data together. This way, any exceptions make up only a small proportion of the total data and aren’t able to drown out the overall pattern. For my study, I am looking at 135 different characteristics, ranging from obvious things, like petal number, to microscopic things, like the branching pattern of the tiniest leaf veins. A herbarium specimen of the legume species Poeppigia procera. From these dried and pressed vouchers, we can study and compare species’ physical attributes. Ontogeny is basically a specialised form of morphology where we look at the flower as it develops. Think embryology for flowers. It doesn’t sound like it would be all that useful, but in fact, there are a lot of things we can’t see in the mature flower that give clues to evolutionary relationships. For example, say Species A has five petals and Species B has four. However, when we look at very young, developing flowers of Species B, we find that it initially forms five petals, but that two of them fuse together and grow to look exactly like a single petal by the time the flower opens. This sort of thing really happens, and it would suggest to us that Species A and Species B might be more closely related than we initially thought. Because we have to look at the flowers at such an early stage, they are extremely tiny (by the time a defined flower bud is visible, it’s already too late). So tiny, we have to use a scanning electron microscope, which is an incredibly powerful microscope capable of magnifying things hundreds of thousands of times (click on the image below for a better look at the scale involved). The developing sepals of a very young Martiodendron excelsum flower. 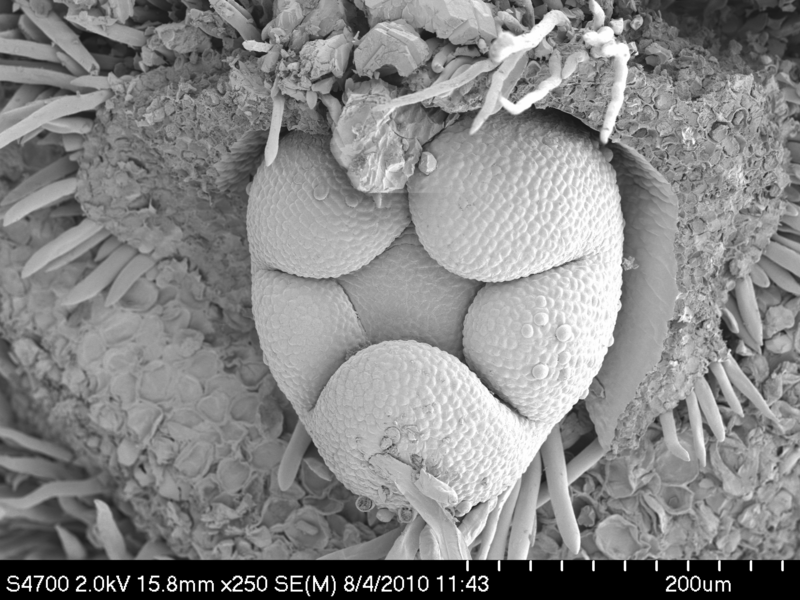 Electron microscopy allows us to study aspects of the flower which are not visible once they’re mature. Like physical form, DNA sequences change slowly over evolutionary time, so we can apply the same principle to them that we use to evaluate morphology. When we line up sequences from numerous plants in a given group, say, a family, those which are more similar are likely to be more closely related. This is referred to as molecular phylogenetics, and is useful in my research as a means of double-checking (and hopefully supporting) the results I get from the other two approaches. 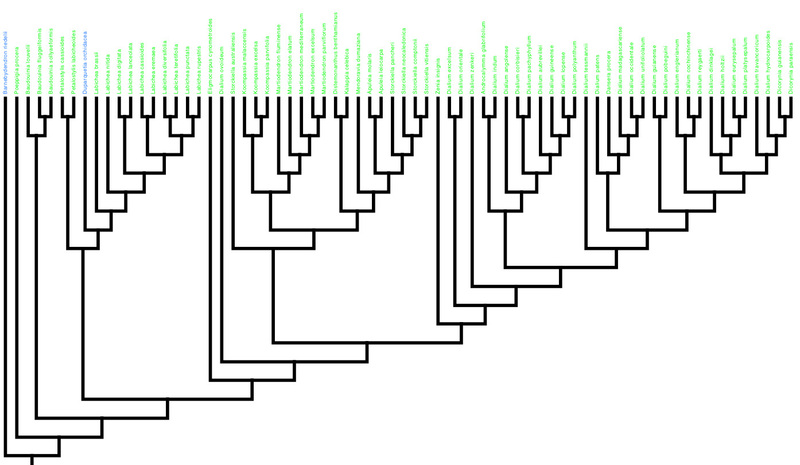 A phylogenetic tree is produced by the analysis of all these different types of data. Statistical programs allow us to know how confident (or not) we can be in the strength of our results. It’s not always obvious what the point of this type of research is, beyond simple scientific curiosity (my personal favourite). There are a few different reasons knowing the phylogeny of a group can be useful. Two good examples are conservation and pharmaceutical research. In terms of conservation, knowing the relationships among organisms can help environmental protection agencies to make informed decisions about which areas to protect, such that the greatest amount of biological diversity can be preserved. In drug research, plants may be found which produce important medicines, but which are quite rare. However, if a closely related species can be found which produces the same compounds and isn’t so rare, those medicines can be produced much more readily. 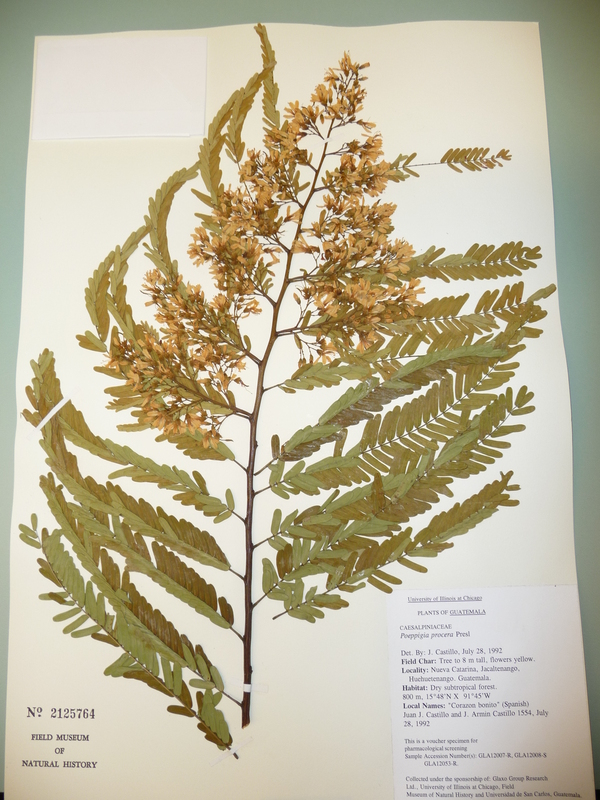 Phylogenetics can provide researchers with clues as to which plants to look for. “Pure” scientific research is often like this- what appears to be mainly an academic exercise can turn out to have surprisingly useful applications.